"Summer" Layout make & take at Jane's! 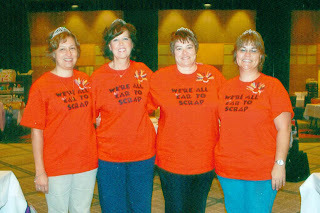 I'm on the Design Team for The Scrapbooking Factory and will be doing the above make-n-take at this months crop. Jane is the owner of The Scrapbooking Factory and has the best crops at her house ... free crops! What's even better is that her store is right there so you get to crop, laugh with the best bunch of scrappin' gals I know, and shop! How great is that! Go check out her website and click on her blog to see the latest news from Jane. I absolutely love all the amazing and thoughtful gifts I received at the SDV. Here are a few of the things I made for Wren, Jackie & Robyn. I enjoy digital scrapping and got this idea for milk cartons Disney style. These remind me of my school days & getting milk for lunch. Each of their milk cartons were personalized with pictures and filled with their favorite candy. I bought 12 cans of 8 oz. fruit cocktail ... removed the bottom of these cans with a Pampered Chef can opener so there were no sharp edges ... poured out the fruit cocktail (and had this for several days) ... clean and dried out the cans. I then decorated them with Disney paper and doodled away. The fun part was filling them. I collected red, white, yellow & black M&M's and put all in a gallon bag since I had to fly out to Florida. I was afraid if I put them all together before leaving then there was a chance security would want to know what was in the cans since I was bringing them with me in my carry-on (chocolate and all). I could just imagine them popping the top on every one of them ... after that nightmare my decision was made. So that left me with 5 lbs of M&M's and 12 cans along with my glue gun in my bag. Ha! What we do for our crafts! Well I filled each can, after I shooed all the girls out of the room, and then used the glue gun to seal the bottom back on. That was the tricky part. I made 12 since I was making one for each of my friends from Florida I met 2 years ago & some new ones I met this year. I loved watching everyone open their cans and see their colorful M&M's inside and wonder how did you get those in there? Okay, I finally did it! I've had some friends after me to start my own blog ... so here it is. I'm still unpacking from our awesome SDV crop in Orlando ... followed by four days in the parks. My husband flew in then and we stayed an extra week. We're Disney fanatics and thoroughly enjoyed our yearly trip to Walt Disney World. The back of the shirt had each of our names and, of course, a crown with jewels!!! The second day we wore the yellow shirt ... mainly because Robyn kept threatening to change out of her red shirt the first day since she loved the yellow one. I used my Cricut to make all the stencils for these t-shirts along with the Mickey & Friends, Mickey Font, Storybook, Going Places, George & Basic Shapes, Locker Talk, Paper Doll Dress Up, and TinkerBell & Friends cartridges. I got the idea for using my Cricut for t-shirts from the Cricut message board. You can just do a search for freezer paper t-shirts.